In a classic tale of turning trash into treasure, two different processes soon may be the favored dynamic duo to turn food waste into green energy, according to a new Cornell-led study in the journal Bioresource Technology. "Food waste should have a high value. We're treating it as a resource, and we're making marketable products out of it," said lead author Roy Posmanik, a postdoctoral researcher. 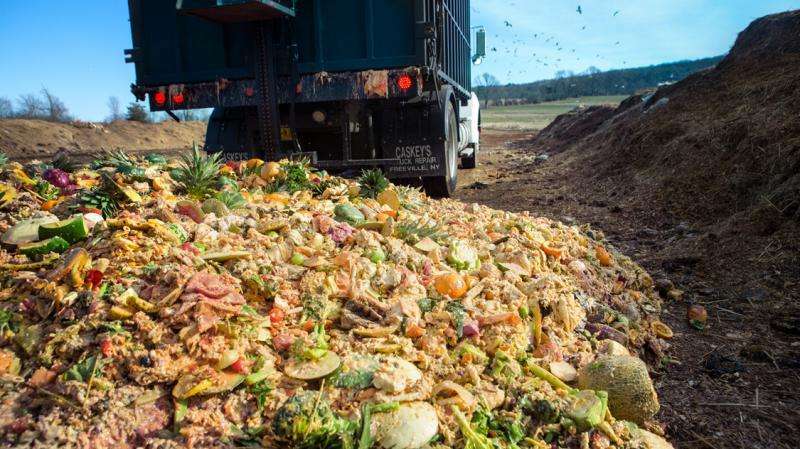 "Food waste is still carbon – a lot of carbon." The researchers show that by using hydrothermal liquefaction before anaerobic digestion, virtually all of the energy is extracted from the food waste. In hydrothermal liquefaction, the waste is basically pressure cooked to produce a crude bio-oil. That oil can be refined into biofuel. The remaining food waste, which is in an aqueous state, is anaerobically digested by microbes within days. The microbes convert the waste into methane, which can be used to produce commercial amounts of electricity and heat. "If you used just anaerobic digestion, you would wait weeks to turn the food waste into energy," said Posmanik, who works in both the laboratories of co-authors Jeff Tester, professor of chemical and biochemical engineering, and Lars Angenent, professor of biological and environmental engineering. "The aqueous product from hydrothermal processing is much better for bugs in anaerobic digestion than using the raw biomass directly. Combining hydrothermal processing and anaerobic digestion is more efficient and faster. We're talking about minutes in hydrothermal liquefaction and a few days in an anaerobic digester." Food waste is the single largest component going into municipal landfills in the United States, according to the U.S. Department of Agriculture. About one-third of the world's food – nearly 1.3 billion tons – is lost or wasted, according to the Food and Agriculture Organization of the United Nations. For all industrialized nations, food waste accounts for roughly $680 billion annually. In addition, composting and digestion of food waste are inefficient and slow. Putting hydrothermal liquefaction first in an engineering process and finishing with anaerobic digestion completes a food-water-energy nexus, Posmanik said. "We must reduce the amount of stuff we landfill, and we must reduce our carbon footprint. If we don't have to extract oil out of the ground to run cars or if we're using anaerobic digestion to make green electricity, we're enhancing energy and food security." The paper, "Coupling Hydrothermal Liquefaction and Anaerobic Digestion for Energy Valorization From Model Biomass Feedstocks," was co-authored by Rodrigo A. Labatut, Pontifical Catholic University of Chile; Andrew H. Kim '17; and former post-doctoral researcher Joseph G. Usack. Anaerobic co-digestion of farm-based manure, food waste, are there benefits vs. landfilling?